Join the adventure through dystopian worlds, to outer planets and into a speculative future. Welcome to the Future Days Anthology. 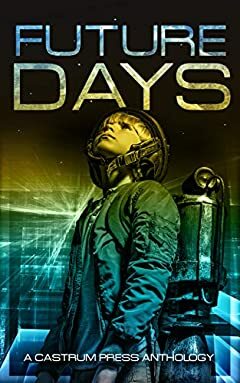 17 authors imagine a future with thrilling tales, starships, unlikely heroes and exotic aliens all of which combine to make Future Days a must-read sci-fi fantasy short story collection. Featuring USA TODAY bestselling author Christopher Nuttall. Amazon bestselling sci-fi authors Rick Partlow and PP Corcoran and award-winning author RB Kelly, alongside rising stars in the sci-fi fantasy genre. Out of work? Need to pay the bills? Donâ€™t worry the government is looking for a few good people to work in the colonies. And, oh yeah, its compulsory. Saiden has abilities. Abilities the government wants to weaponize. Only one thing stands in their way, Ret Saiden. When the line between a utopian virtual world and harsh reality become blurred, the choices we make can be fatal. Heroes come in all shapes and sizes. Who would have thought convicted criminal Slade would be one of them? Ever-Young Cryogenics promise its clients a brief spell of life every decade. But, what happens when your family grow old and die, but you donâ€™t? In a hierarchical society decided by birth, instructions must be followed. Unless you are a radical and want to destroy the system. Jada is a businesswoman intent on climbing the corporate ladder by sealing a lucrative deal. That is, until a Being from another reality intervenes. Only a special kind of person volunteers to stay awake during the long voyages between the stars while the rest of the crew sleeps. But what happens when he gets lonely? A job she hates on a world with too many problems. But what if she can escape to a new world and start again? Can she leave everything she knows, and loves, behind? Denton, a man who would do what needed to be done to survive in the â€˜Pitâ€™. The lowest, dirtiest, crime ridden part of a mega city forgotten by the â€˜One Percentersâ€™ living in their luxurious towers. A new world. Ripe for colonization. Pre-prepared by nanite Seedlings for the arrival of their human designers. But what happens when the designers become your God? â€œGhostsâ€ by award winning author RB Kelly. The storms bring the Seekers. Machines with one purpose, to bring death. Only sometimes death is not quite death. â€œMotherâ€ by Amazon #1 bestselling author Rick Partlow. A motherâ€™s love is the strongest of all. Protect and nurture your children to your dying breath. Even if that means genocide. â€œThe Cullâ€ by Amazon #1 bestselling author PP Corcoran. Humanity has reached its peak. Genetic manipulation makes humans faster, smarter and stronger. But at what cost? â€œThe Rescueâ€ by Claire Davon. An Alien shuttle is downed. Lt. â€˜Deeâ€™ Delaney must find it and secure the alien survivors until help arrives. Easy. If Delaney can trust her own people. â€œThe Man-Eaterâ€ by USA TODAY bestselling author Christopher G. Nuttall. wants to prove his engine works. How? Why you steal it of course. Sergeant Joel Edwards is wakened seconds before being dropped into combat. A faceless enemy. A nameless place. All he knows, is a cyborg is ready for anything.